Even wonder how you can send Group Messaging on iPhone 4 with iOS4? There are few apps that you can try but if you are aware, since iOS 4, iOS has Group Messaging feature built in that can help you to achieve this without any new apps being installed. First, tab on Settings icon on your Home screen. Then browse to Messages sub menu and tab on it. 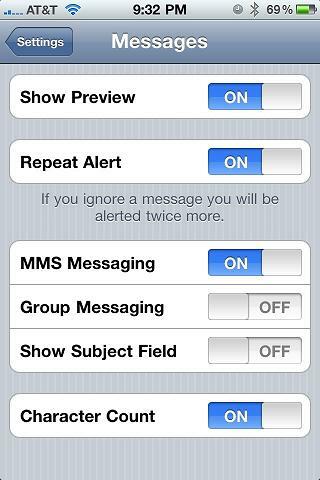 Look for Group Messaging and toggle it to ON. Apparently, this helps to save a lot of time especially when you are trying to deliver a standard SMS messaging to all the recipients. And instead of typing one after another, you will be able to tie all of them in for broader communication at one shot, in a chatroom-like environment, not to mention about saving of SMS cost charge. Depending on the recipients if they have turned on the Group Messaging feature or not, they will have option to see all the recipients in the single communication thread. And once any of the recipients respond to the original text messaging, all the other recipients in the lists will be able to view it. For instance, if a recipient didn’t turn on Group Messaging feature, then they will only see their name on the thread. But once it is turned on, all the recipients’ name will appear in the thread. However, not all iPhone iOS4 iDevice will be able to enjoy such feature with only AT&T users claimed to have it now. This is understandable as it may really depend on carriers if to enable it due to conflict of interest. Do check out yourself if your iOS 4 devices have such capability and share with us on actual users’ experiences.